I was excited when I was asked to be a part of BlogHer's Getting Noticed This Holiday editorial series. I wasn't sure what I wanted to write about. Then, I realized that what gets me noticed are my outside-the-box Christmas touches, ideas that require very little money, but make me smile, and inspire others. I started reviewing some of my Christmas ideas, past and present. 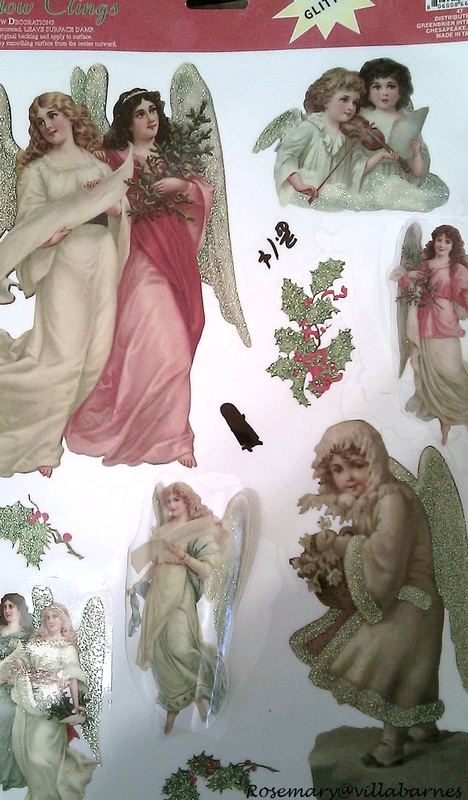 Here is a small selection that I hope will spark your imagination, and some holiday decorating of your own. This is one of my favorite quotes. I used it in a post at the beginning of the year, and as this year winds down, I've found myself reading it over and over again. Peace is what we should have this season. Some stressful situations can't be avoided, but Christmas decorating shouldn't be a source of stress. Take time to enjoy the season. 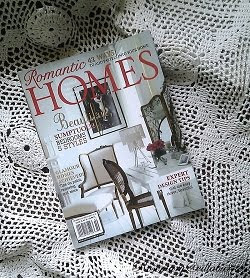 Because I buy and sell for a living, my decor usually changes constantly. Seriously, the only thing in my house that's sacred are my husband and kids. Things come and go. Using my imagination, I decorate with whatever I have on hand. I created the vignette you see above recently. 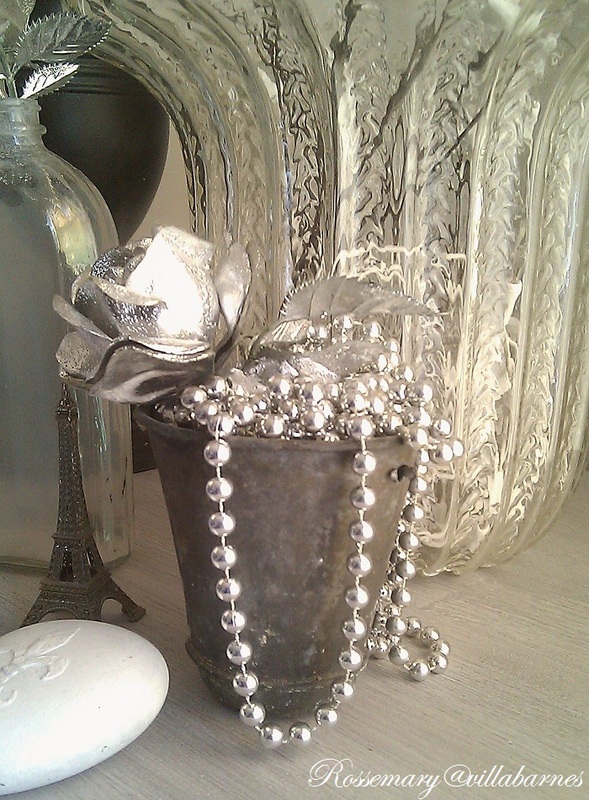 A galvanized pot, filled with silver beads, and a plastic rose sprayed with silver paint add a festive touch, that is also simple and economical. The beads were from a garage sale. I bought a huge bag full for $1.00. 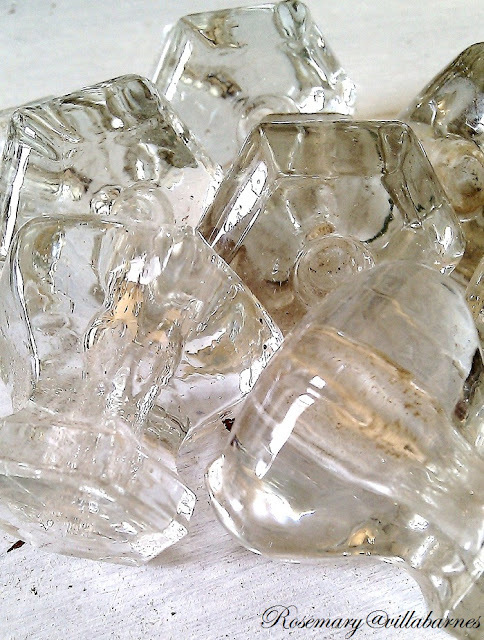 In the background is the large glass vase I've used in multiple ways. Right now, it holds white Christmas lights. Last year, I used it in a different vignette. The glass vase was from an estate sale. It was originally in a metal base. Here, I placed it inside a stone base. There was a little space left over. 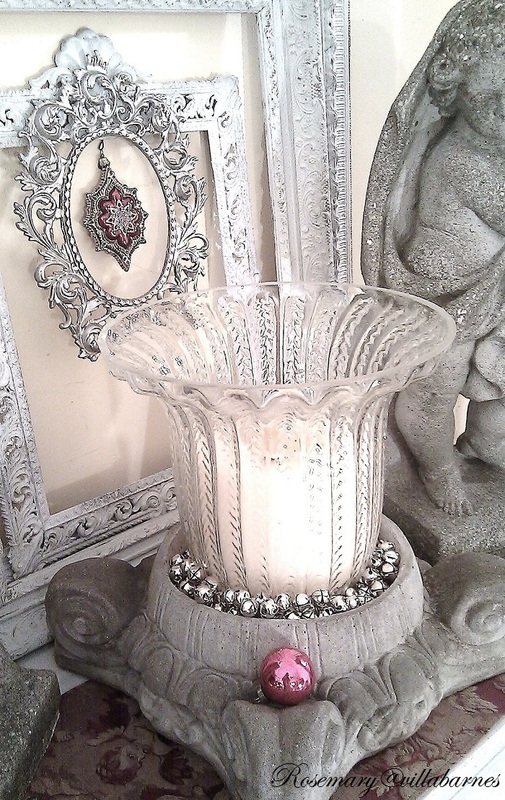 So, I filled in the gap with jingle bells, and inserted a pillar candle. 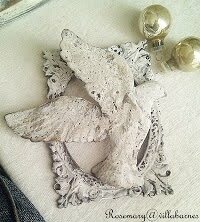 Three white frames, and a silver leaf frame provide the backdrop. To add a touch of color, I hung an ornament from the center frame. I considered it my wreath. I placed some jingles bells on my cherubs as well. One of my favorite, and very simple, ideas is a gift-wrapped footstool. 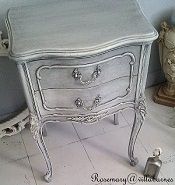 I painted the legs silver, and criss-crossed green burlap over the top. A sprig of greenery lightly touched with gesso. That's right, I just brushed the gesso on. It's like a kiss of snow. 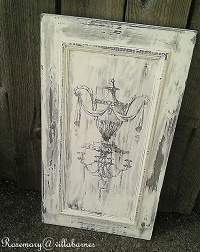 If you don't have gesso, slightly watered down white paint will work as well. I filled a pot I painted white with gauze, and inserted the evergreen. 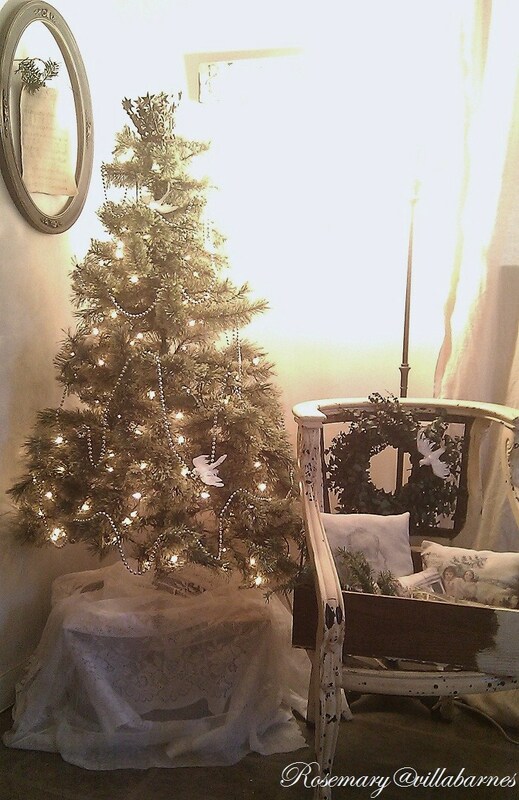 I kept it simple, but you could add ornaments, glitter, garland, etc. Crystal knobs are one of my favorite things to decorate with. They make a great base for mini trees. Because I redesign furniture, I always have some around. 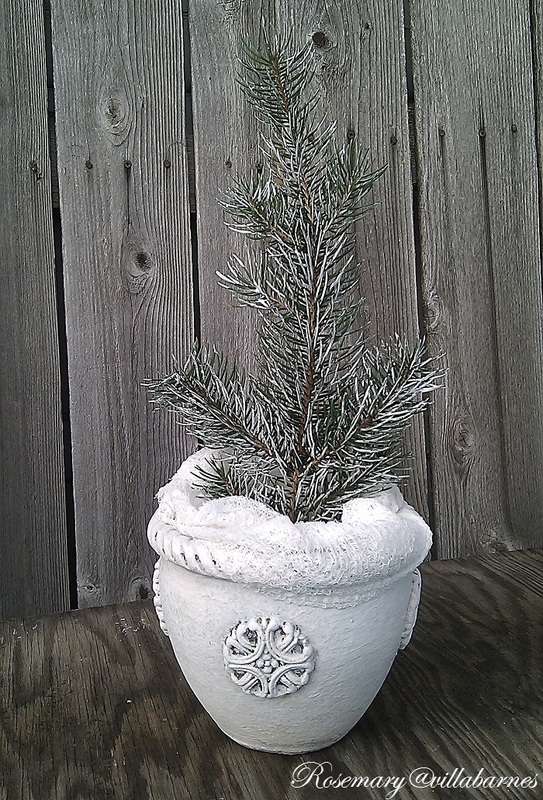 Last year, I added sprigs of pine. Sitting on a sheet of gauze, they look like chunks of ice. 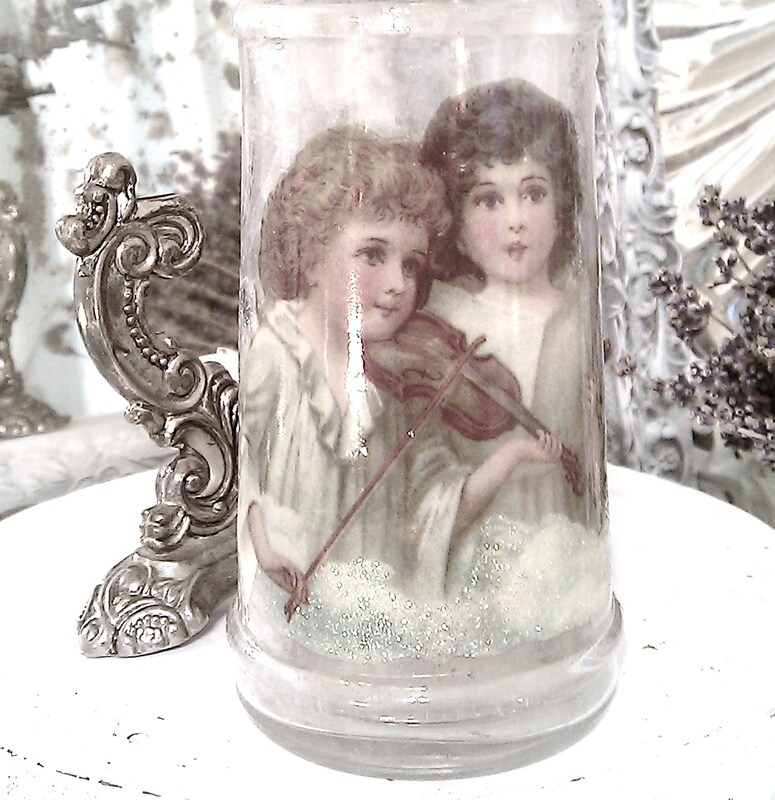 They were a part of this vignette I put together on top of a cabinet. I don't have a mantel. If you don't either, this is a good alternative. 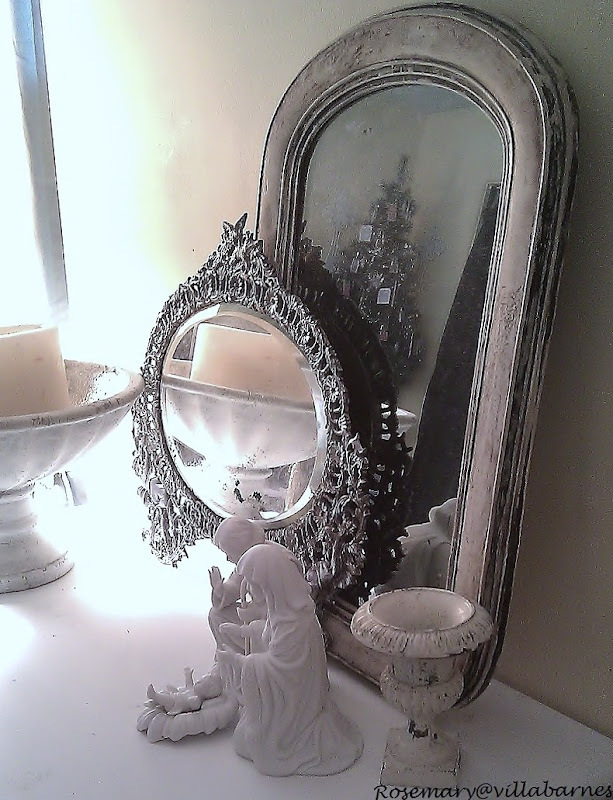 White gauze, and various painted metal pieces made for a nice little winter wonderland. 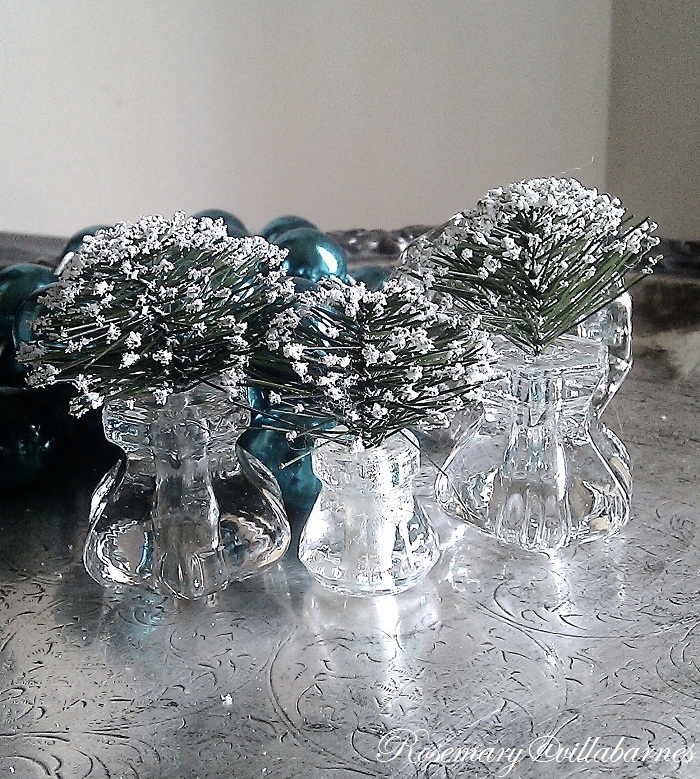 This year, I placed bottle brush trees in the knobs. 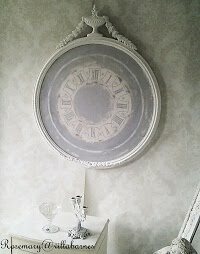 The silver tray adds a little reflection. 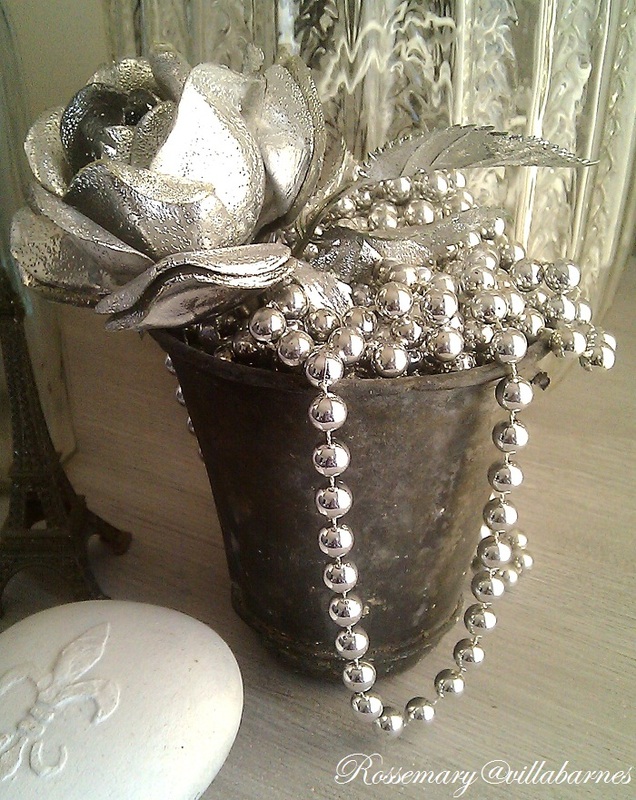 Some of my silver beads are draped around my little tree. Instead of a star, my tree has been crowned. My Christmas decor is somewhat monochromatic this year. Actually, is has been that way the last couple years. After my sons grew up, I was able to narrow my color choices. When they were young, I had to decorate with all the traditional Christmas colors, and feature every ornament they ever made. EVER. It was whimsical and fun, but I'm going for simplicity now. I find simplicity peaceful. 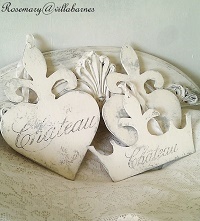 I created this vignette last year. Very serene. It says Christmas, but it didn't require many elements. A vintage mirror reflects my tree. 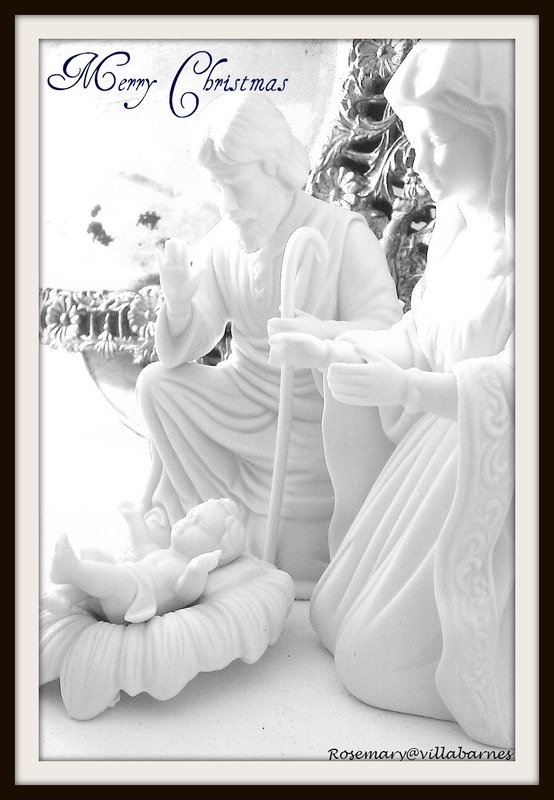 I used one of my photos of this nativity to create a Christmas card. It was very personal, and everyone loved it. I could go on and on, but you get the idea. Christmas decor doesn't have to be stressful. Make it fun, and used your imagination. Think outside-the-box, and get noticed for your awesome creativity. 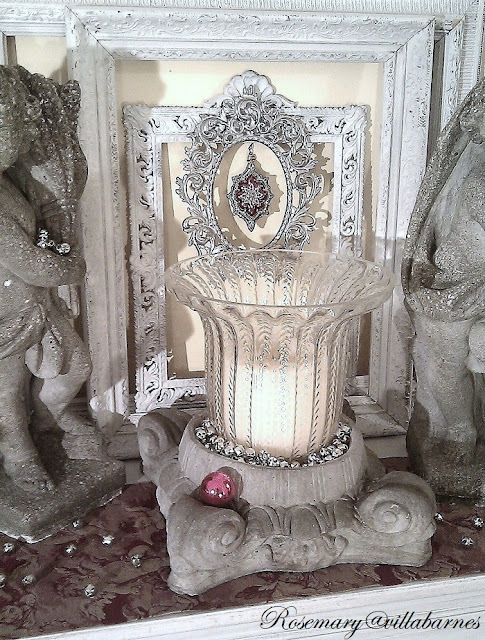 This post is part of BlogHer's Get Noticed For the Holidays editorial series, made possible by Cover Girl. 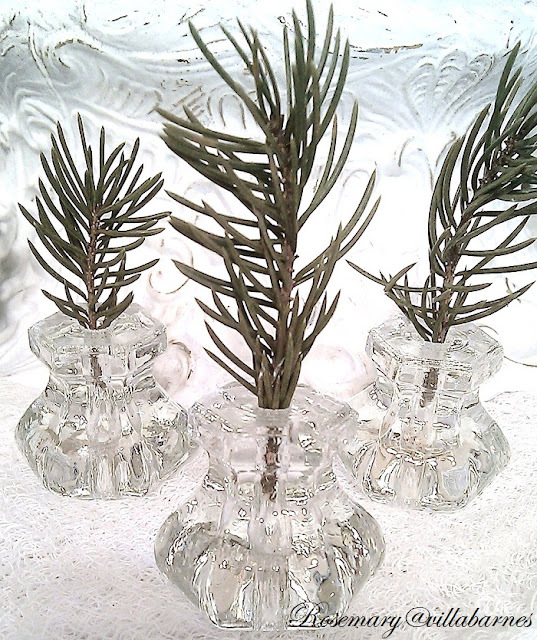 You had me at "frugal" Rosemary! I love how you put the window clingers on something other than windows...very creative! There is no doubt in my mind Rosemary that you have the "touch"! You know that woman who no matter how she displays things, photographs things, etc., they all come out absolutely stunning! You are her! As usual my head is spinning with all of your ideas! I love the hurricane with the white lights in it and that's a great way to use those window clings! I love the door knobs with the greenery in them -- adorable!! 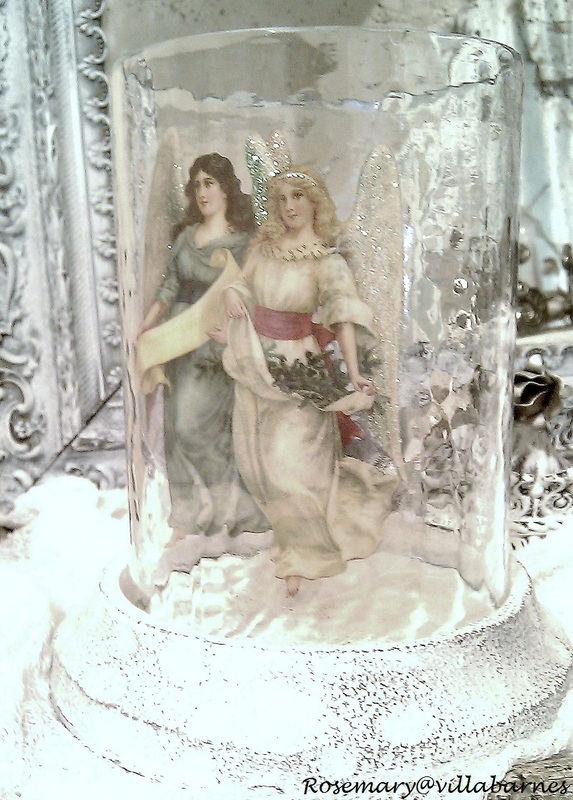 Love the ideas for the angel clingers as well as the glass doorknobs. Rosemary, you are the best at everything you do, and I love your blog. Great inspiration, thanks for the post! Love the vase with the window clings. 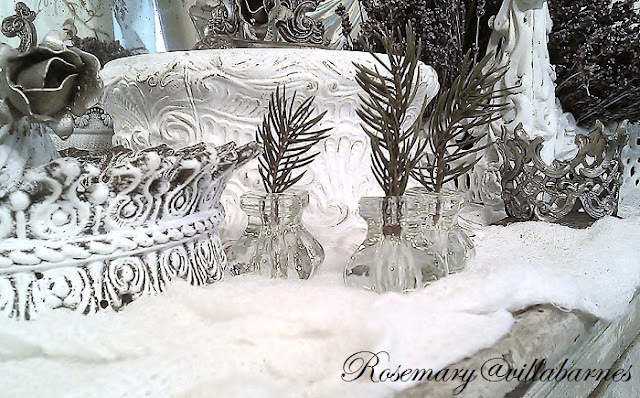 Great ideas and vignettes, Rosemary! 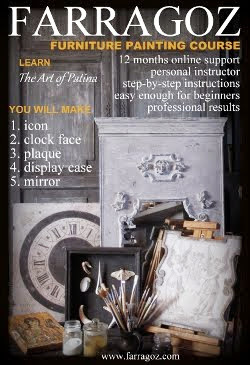 I love how you used different things in different ways, like the glass knobs. Beautiful post, Rosemary. I really liked the clinger idea and how you used them. Everything looks so pretty. I love the knobs. Your nativity is so nice too. Beautiful and creative at its finest Rosemary! I love all that you shared abput peace. Wonderful words to live by. Gorgeous ideas my dear. There's a lot to be said for thinking outside of the box, put together with creativity and determination the possibilities are endless. Thanks for the inspiration Rosemary! Petite white lights in a glass container - going to do it. I am in a rental now as I await the re-model of my cottage just around the corner and all Christmas decorations and creative accessories are in storage. The white lights I can easily do. 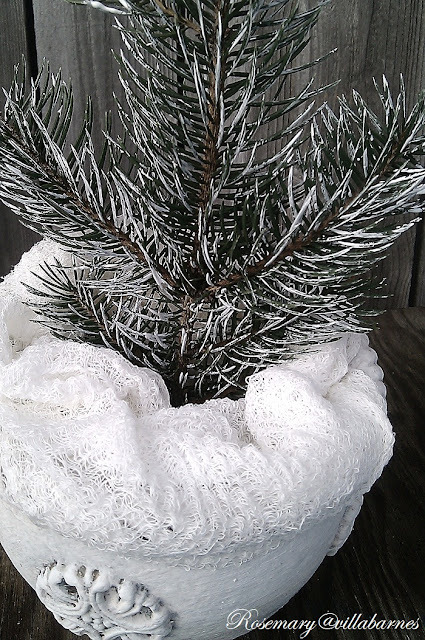 I intend to wrap them up a tree in my soon to be new front yard because I love the simplicity of that look. Thank you, as always, for the inspiration. Rosemary, I'm in love with EVERYTHING. You've definitley got the touch. I would have never have thought to use those clings in that way. You inspire me. Love your ideas, you hit hte nail onthe head every time. So romantic. frugal? yes. creative? yes. beautiful? absolutely. I think you catch my notice every time. What awesome ideas, Rosemary! I love your nativity card, and also those pretty glass crystal knows. One of my favorite ideas I see here are those clings you put on a glass hurricane. It's all so beautiful! How do I choose a favorite? I love everything. What a great idea to wrap up the stool to look like a present, and those glass knobs are so sweet and simple with just a touch of greenery. Oh, I just love it all...especially those adorable tree holders! Just lovely, Rosemary. My fav is the glass vase with all the frames over laid. So very chic! Thanks for all the ideas. 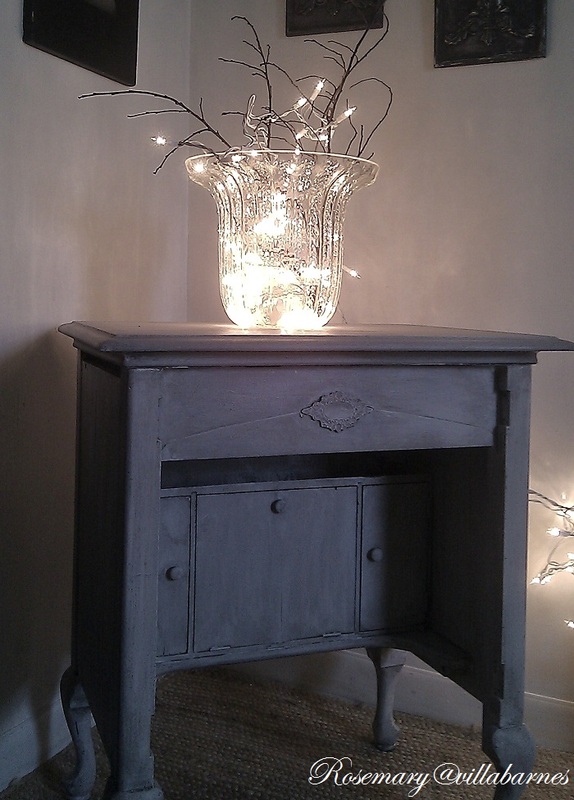 You do have amazing ideas for affordable decor for Christmas but I notice you all year around - you have talent! All so fabulous Rosemary! With your name being Rosemary you should have a rosemary tree in your kitchen for Christmas:) Love your ideas especially the one about the window clings. I was looking at them the other day in Big Lots (a dollar store) and wondering how to use them other than on windows. Now I know. Thank you so much for the inspiration and happy happy holidays. Rosemary, your creativity never ceases to amaze me! 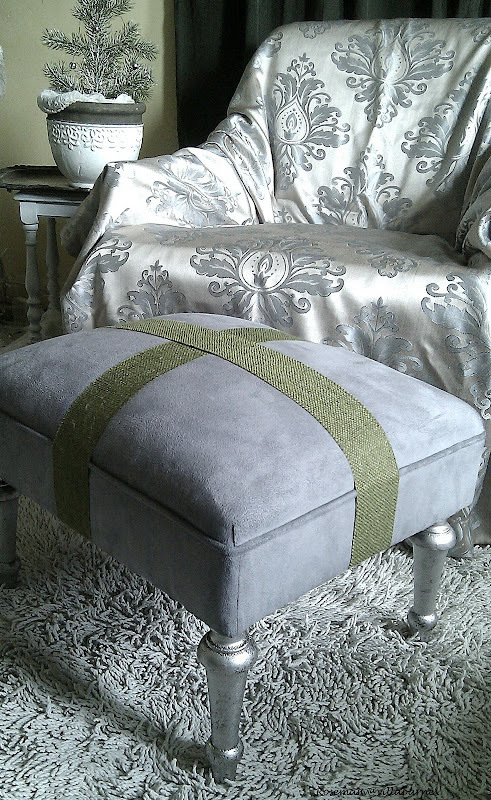 Love the gesso on the greenery and the simple wrapping of your footstool. All of it is lovely.